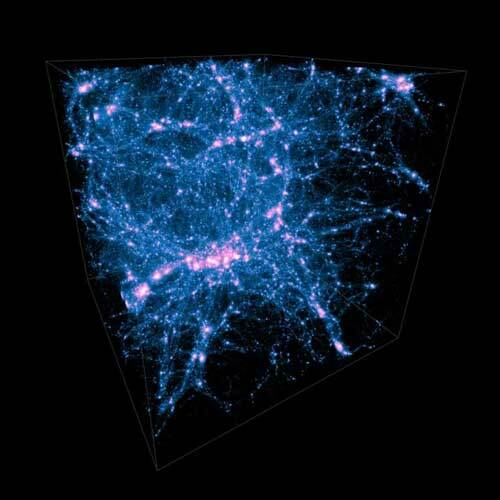 (Nanowerk News) The scaffolding that holds the large-scale structure of the universe constitutes galaxies, dark matter and gas (from which stars are forming), organized in complex networks known as the cosmic web. This network comprises dense regions known as galaxy clusters and groups that are woven together through thread-like structures known as filaments. These filaments form the backbone of the cosmic web and host a large fraction of the mass in the universe, as well as sites of star formation activity. In a just-published paper (Astrophysical Journal, "Cosmic Web of Galaxies in the COSMOS Field: Public Catalog and Different Quenching for Centrals and Satellites"), astronomers used a sample of 40,000 galaxies in the COSMOS field, a large and contiguous patch of sky with deep enough data to look at galaxies very far away, and with accurate distance measurements to individual galaxies. The large area covered by COSMOS allowed sampling volumes of different densities within the cosmic web.